Astronomers have successfully commissioned a new type of optic that can reveal the image of an exoplanet next to its parent star. The 'vector Apodizing Phase Plate' (vector-APP) coronagraph was installed at the 6.5-m Magellan Clay telescope in Chile in May 2015, and the first observations demonstrated an unprecedented contrast performance very close to the star, where planets are more likely to reside. These results will be presented by PhD student Gilles Otten this Monday afternoon to the scientific community at the "In the Spirit of Lyot" conference organized by the Centre for Research in Astrophysics of Québec and researchers at the University of Montreal. Almost 2000 exoplanets have been detected to date, but only a handful of those have been imaged directly. Exoplanets are typically more than a million times fainter than and are lost in the glare of their parent star as seen from Earth. To directly image exoplanets and to characterize their atmospheres, astronomical instruments at the world's largest telescopes use coronagraphs to suppress the overwhelming halo of light from the star. The vector-APP coronagraph uses the wavelike nature of light to cancel out the starlight whilst allowing the planet's light to shine through. This manipulation is implemented through a complex phase pattern that can only be manufactured using advanced liquid crystal 3D patterning techniques. This technique creates two images of the star, for which dark D-shaped regions are located on opposite sides of each star image (see Figure 1). In this way, the whole region around the star can be scrutinized for planets. By combining several layers of liquid crystals, the device can be used over a wide range of wavelengths, including the infrared where the contrast between planet and star is more favorable. On May 6, 2015 a vector-APP coronagraphic device saw first light (at 3.9 m wavelength, in the infrared range of the spectrum) at the MagAO instrument, attached to the 6.5-m diameter Magellan Clay telescope in Chile. 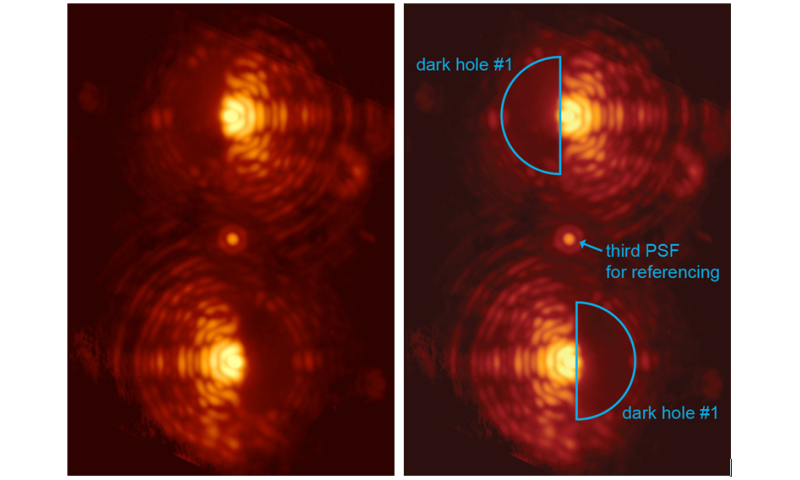 The telescope's integrated adaptive optics system provided the instrument with sharp images of stars, which were consequently split up and modified by the coronagraph to exhibit dark holes in which much fainter planets could be imaged than without the vector-APP coronagraph. 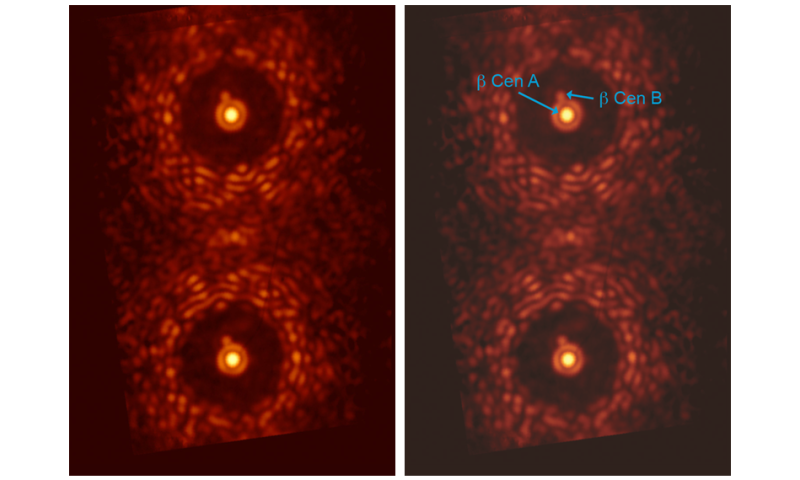 A double image of the star beta Centauri taken through an experimental version of the vector-APP coronagraph installed at MagAO. Both images of the star contain a dark region that covers the complete 360 degrees around the central star. In both cases, the binary companion to beta Centauri is easily detected. Credit: Leiden University, University of Arizona. "It is fantastic to see that after all our design work and lab testing, this new approach works perfectly at the telescope on the very first night!" "We knew that we were in business as soon as we saw the first picture on the screen in the telescope control room." "With this new coronagraph we are now looking for planets around nearby stars. We have the capacity to directly detect, or rule out, planets smaller than Jupiter." "This new coronagraph technology is also excellent news for the extremely large telescopes currently under construction. Thermal infrared instruments such as the Mid-infrared E-ELT Imager and Spectrograph (METIS) can exploit this new technology and discover new worlds. With a vector-APP coronagraph in the next generation of telescopes, we can search for planets around nearby stars with unprecedented sensitivity." The advanced liquid crystal technology that the team adopted also permitted the production of extreme vector-APP designs that are not possible with more traditional manufacturing technologies. These new designs produce dark holes that cover the full 360 degrees around the target stars. The first data from an experimental device already shows the viability of this novel approach (see Figure 2).